Leaders intuitively understand the value of using team building activities for workers. That's why so many download our free eBook, Team Building At Work, which provides fun and effective team exercises on many leadership topics. This chapter focuses on the important subject of profitability. One of the most important keys to increased profitability is the leader's willingness and ability to get employees fully engaged and working together. Aligning your team with a clear vision of the company's goals will assist all team members in meeting the expectations of their role. Leaders can assume that for the most part, team members want to do a good job. They want to meet the expectations and goals that are assigned to them. However, their ability to do so can be limited if their leader is not a good communicator of the company's vision, or does not possess the team building skill necessary to keep everyone working well together. In order to ensure team members fully understand the importance of profitability, great leaders will teach their team precisely how the organization makes money. Above and beyond meeting a sales goal, employees must have a solid understanding of action they can take to increase profits by maximizing revenues and decreasing expenses. By teaching your people the ins and outs of how the company makes money, you increase their awareness of the bigger picture of the business, and that better prepares them for a future leadership position. "No matter what business you are in, you cannot afford to overlook the importance of profitability. Profits are the lifeblood from which all your dreams can be achieved." Leaders who create a team culture where employees track progress, and feel a sense of professional responsibility for the financial results of the organization are more likely to see improved production and profitability. Those leaders who are successful at creating a team of people who do not hesitate to call out opportunities to decrease financial waste, are helping to secure the future of the team and the organization. 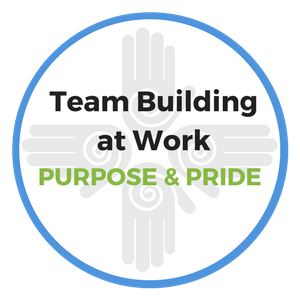 Purpose: To lead your team toward a brand new vision of what your team or organization will be going forward. Make today the first day of creating a brand new vision for your team or company. Explanation: Provide each member of your team with three blank 3x5 cards. On the first card, ask each team member to write 3-5 words that currently describe the shortfalls of your organization. Encourage them to be direct and honest. There are no right or wrong answers. On the third card, have your team members list 5 specific actions the team can take to ensure the company will be able to achieve the vision on the #2 card. Once everyone has completed their list, next ask them to list at least 2 actions that will commit to doing personally to achieve the vision. The leader can now collect all of the cards and spend some time prior to the next meeting to analyze the feedback presented. At the next meeting, the leader will provide a detailed summary of the #1 cards listing all of the shortfalls of the current organization. In a powerful display, the leader will either burn or shred all of the #1 cards. As the cards are destroyed, she can state firmly, "Folks, as of today we can no longer be this organization. The rest of our day will be spent on determining how we are going to be a better, more productive and more profitable organization." The leader will then detail the vision that has been determined based upon the feedback from the #2 cards, and will reward and recognize team players for their personal commitments to achieving these new goals. Using team building activities for work issues like this one, leaders can quickly identify barriers as well as solutions from the people who are closest to the front lines, their people. "There's nothing greater in the world than when somebody on the team does something good, and everybody gathers around to pat him on the back." Purpose: To teach a sales team the power of asking qualifying questions in order to properly recommend products and services to their clients. By meeting more customer needs, they'll sell more products and services and as a result, increase profitability. Explanation: Interviewing, or Profiling, your customers in order to recognize their true wants and needs is a must for any great sales person. A successful sales person understands that by asking quality questions up front they can minimize the number of withdrawals, cancellations and returns of their products and services. Customers cannot argue with the answers that they give you. Therefore, if you ask questions in a way that will get your customer to tell you what he needs, you will be able to more easily make the appropriate recommendation and receive fewer objections to your recommendations. "You can get everything you want in life, if you will just help enough other people get what they want." Work with your team members to identify the best qualifying questions they can ask their customers in order to clearly understand their needs. What are your current savings goals? What are some future things that you need to be saving for? Ie. Weddings, Retirement, Education, etc. How do you currently budget your money? Has anyone recently reviewed your monthly expenditures to see how you might realize some additional savings? When was the last time you had your insurance product reviewed and updated? What rate are you currently paying on your car, your house, your boat, other? How many credit cards do you have and what rates are you paying on them? As a team, revisit this exercise often. Over time work to perfect the questions and watch your team's production steadily increase. Ask your team to share the most common objections they hear from customers, then discuss how best to response to each one. Script each response and have team members practice responding to each example. As you create each response, remember the best way to overcome objections or barriers is by taking additional time to further educate the customer. Don't think for a minute that you are doing anything that is not in the best interest of the customer. Your customer will truly appreciate the time you take to ask qualifying questions and by taking an interest to identify their needs and make quality recommendations, you will quickly earn their trust and build credibility as an expert in your field. Have fun using team building activities for work-related challenges. Your team will appreciate your efforts to improve teamwork and will enjoy the rewards of their increased results. 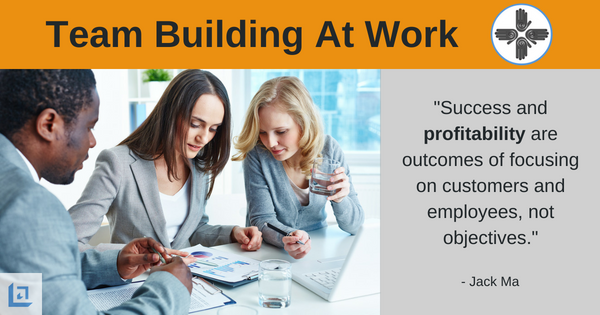 Start leading team building activities for work-related issues. 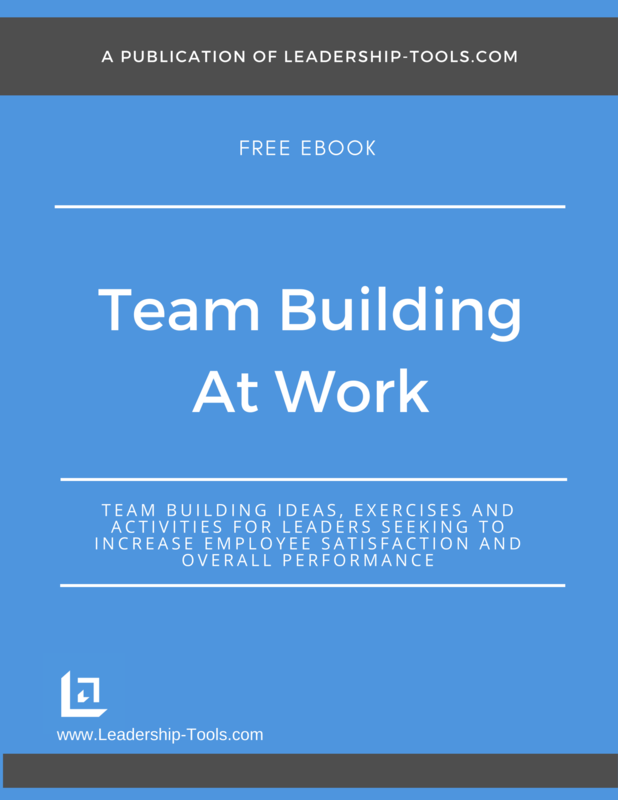 To download our free Team Building At Work eBook, providing team building strategies, ideas and exercises, simply subscribe to our free newsletter. You will immediately receive a password that grants access to our entire leadership tools library.